Holt High School, is located near the site where Governor George C. Wallace made the famous stand in the schoolhouse door and an hour away from the location of the church bombing at the Sixteenth Street Baptist Church depicted in The Watsons go to Birmingham--1963. Although Alabama is rich with history from the events of the Civil Rights Movement, many students do not have an informed understanding of the events that were a part of their community history. At Holt High School, a Professional Development School in Tuscaloosa, Alabama, teachers and University of Alabama faculty decided to focus on this topic drawing on community resources and experiences. It was hoped the study of the novel would engage all participants in an active process of reading responding, sharing, and crossing borders as we studied the Civil Rights Movement. In one classroom, Melinda Lake taught World Affairs, a social studies elective for grades 9-12. She decided to incorporate The Watsons go to Birmingham—1963 into her class to illustrate racism and discrimination. To introduce the book, the class viewed the documentary 4 Little Girls directed by Spike Lee (Home Box Office). 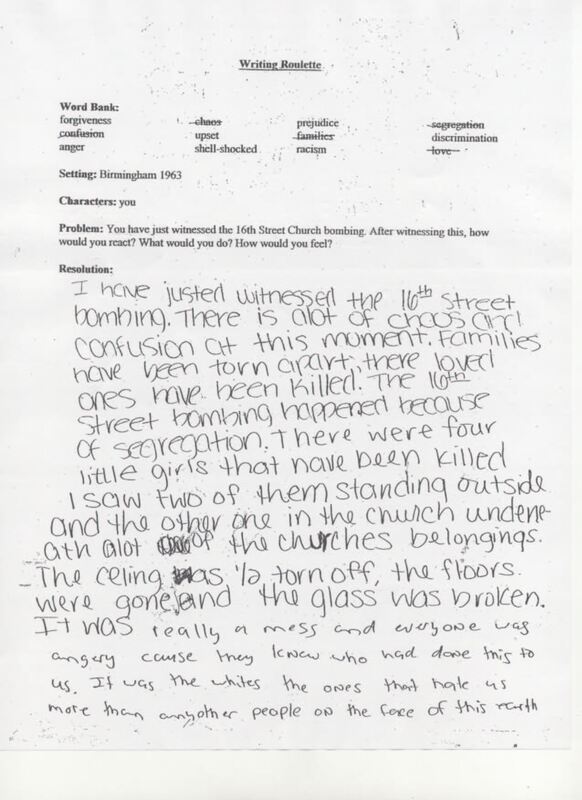 This led to a class discussion of the students’ prior knowledge of the Sixteenth Street Baptist Church bombing. Interestingly, there were some students in Ms. Lake’s class who were unaware of the events that took place in their own state. The preservice teachers observed Ms. Lake and her class in the introduction to this unit of study. They continued to observe other activities as they prepared for their teaching activities. Prior to teaching their lessons, the preservice teachers and their university instructor worked with Ms. Lake, observed lessons, viewed historical documentaries on the Civil Rights Movement with the class, and facilitated activities related to the book. Ms. Lake used a variety of strategies as students read the book (e.g., student and teacher reading aloud, audiotaped readings). One strategy used in Ms. Lake’s class was the writing roulette that was used to stimulate critical thinking as well as empathy and emotion while they engaged in a creative writing activity. In addition, this writing strategy can also serve as a reinforcement for vocabulary knowledge. After students have read a reading selection, the teacher divides the class into groups of three and provides each student with a story structure that includes: (a) a setting and characters, (b) a problem or goal, and (c) space provided for a resolution as well as a word bank of vocabulary words (Click here to obtain a printable copy of the story structure). To begin the activity, students are instructed to write focusing on the settings and characters; students should use at least two words from the word bank provided underlining them in their stories. After an allotted amount of time (usually three to five minutes), group members will stop writing and pass their papers to the group member on the right. After reading what the previous author has written regarding the setting and the characters, each person is asked to write about the problem or goal. Since it will be necessary to read what has been written, the time limit for this and the following step can be extended. At the end of this round, each writer passes the story to the right and each writer begins to conclude the story. At the end of this round, the three group members have contributed to all three stories. They will probably find that they have written very different stories; the formats might use different genres (e.g., letters, editorials, stories). After the final step, the group members should read all three stories and may select one to be read to the entire class. The teacher can post all of the finished stories for students to read. This activity was designed to complement The Watsons go to Birmingham to help students become more empathetic, caring, and peaceful in their own home and school communities. 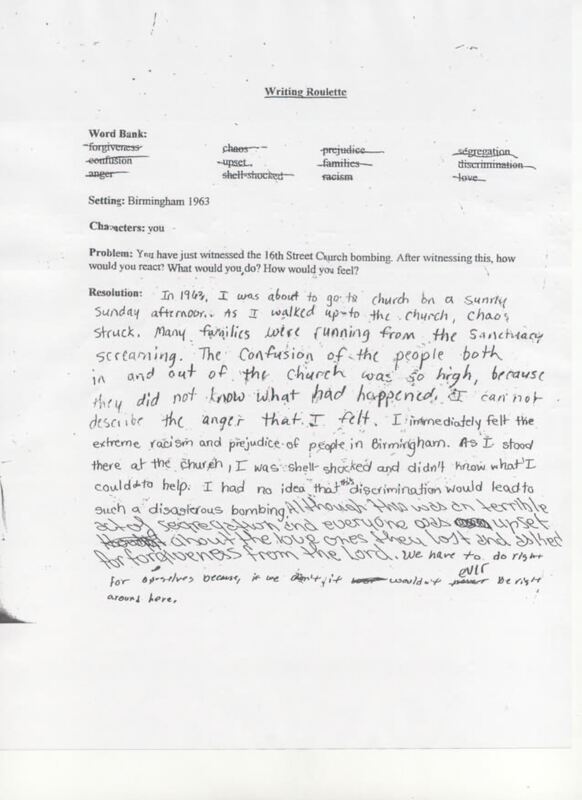 In examples 1 and example 2 writing roulette activity allowed four different writers to create one story using a prompt that placed the writer at the bombing of the Sixteenth Street Baptist Church. The biopoem is a writing strategy that can be used to stimulate thinking about concepts, historical figures, and literary characters. Students can use the format below (Click for a printable version of the biopoem activity) or teachers can adapt the format to suit the concepts selected. 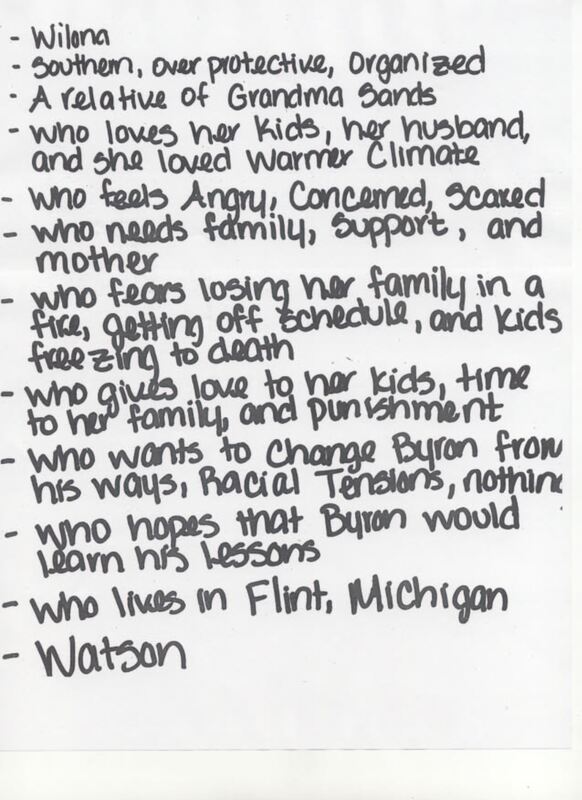 As a means to review the characters in The Watsons go to Birmingham—1963, the students in Ms. Lake’s class were divided into small groups and assigned a character in the book. This activity allowed the students to collaboratively explore the feelings, emotions, and dimensions of the book’s characters. Each group presented their biopoems on overhead transparencies projected on a screen. 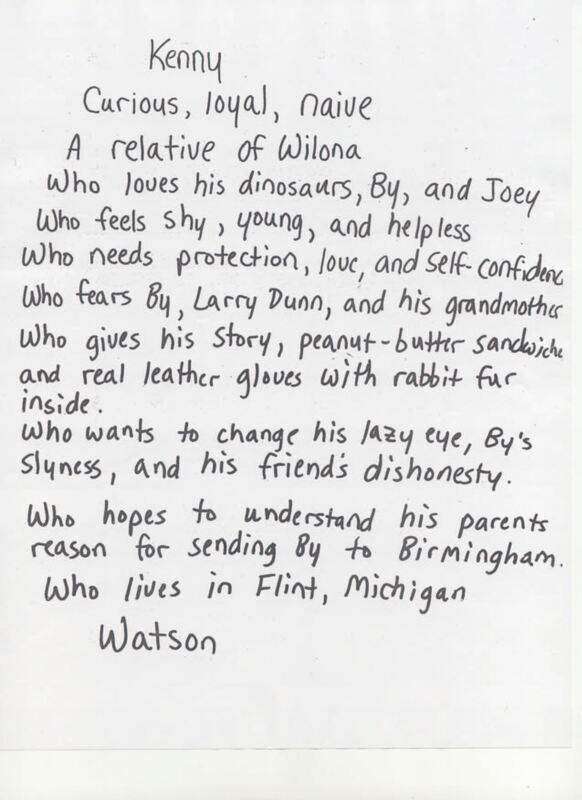 The presenters covered lines 1 and 12 and the other students in the class guessed the characters (Click here to see example 3 and example 4—biopoems for The Watsons go to Birmingham). As demonstrated by the student writing in the writing roulette activity, students developed the capacity to empathize with the characters in the novel as well as those individuals personally affected during the Civil Rights Movement. The teaching team worked diligently to facilitate honest conversations about difficult topics including violence, racism, and discrimination.